Several years ago I made this Candy Jar Quilt for my sister Nancy. On the shelf are all sorts of items that reflect events and locations from her life. The books all have titles of real books that also represent her travels and interests. I have entered this in the Viewer's Show and Tell at Quilting Gallery. I'd appreciate if you popped over there and voted for Nancy'quilt. You can vote for up to 4 quilts. While I would prefer you vote for this one, please vote for the quilts that you like the most. 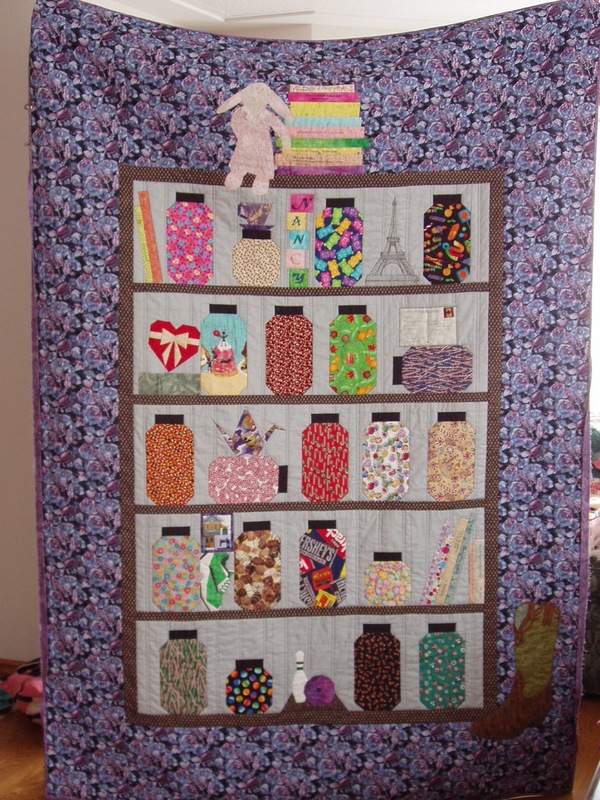 If you would like to see more detailed photos of this quilt and how it went together, the posts are all under the candy jar label. This is and was one of the nicest surprise gifts I ever received, I love it and sleep under it and it brings me comfort because I know it was made with love. That was tough. Even though I didn't like some of them I could have voted for more then just four. Imagine my surprise when one of my favourite ones was a German one! I was totally thrilled about that. Is that a weekly event? Must go there more often! You know I'm always impressed by your quilts but it has to be said I think this is my favourite so far, I'm away to register my vote now. Beautiful work and so special because it is so personalized. Lovely! Thanks to everyone who took the time to visit the show and tell and vote for their favourites. My sister's quilt placed in the middle of the pack. Great results. Heather, that is not only a great looking quilt but I loved that you made it so personal. Fantastic. That is beautiful and so nice it was about personal things that happened. I have no talent in this area. You did a fantastic job.